Tinnitus described in general terms is the ringing in the ears. Generally it is experienced when there is no sound and becomes evident due to prolonged or sudden extreme sound exposure. Although not a disease in itself, Tinnitus causes unnecessary stress and frustration and can be an indicator of some other ongoing problems in hearing function or brain. Some of the causes for tinnitus are loud noise, reaction to medication, tumour in brain or hearing system, Meniere's disease, pregnancy, anaemia, overactive thyroid, Jaw-joint misalignment or twitching of ear or throat muscles. These causes can worsen with stress and fatigue therefore it is advisable to undergo tinnitus treatment without any delay. Generally, an Ear, Nose and Throat Specialist should be the first person evaluating. This would eliminate other treatable problems. While research is still going on to find more about tinnitus treatment and a suitable cure, some options are available to minimise its effect on a sufferer's daily life. If hearing loss is identified, hearing aids would typically be suggested to reduce or neutralize frustrations and stress in lifestyle. If no hearing loss is detected, a device called, Therapeutic Noise Generator is suggested for tinnitus treatment. This device works in a human ear like a hearing aid to take the sufferer's attention away from the ringing in the ear by producing sounds that stimulate hearing nerve fibres. Another effective drug free tinnitus treatment is through Cognitive Behaviour Therapy (CBT) managed by a clinical psychologist. CBT has a three prong approach in reducing the impact of tinnitus: a) by altering the perception about tinnitus, b) by suggesting ways in diverting attention away from tinnitus and c) an approach directing towards controlling stress. The only treatable tinnitus is the one related to a jaw alignment problem. If this is found to be the cause, then consult a dentist specialising in jaw alignment. All cases in tinnitus treatments are typical in its nature and very specific to each individual, therefore, individualized tinnitus treatments are recommended for every individual. If you suspect you have a tinnitus problem, its best to consult your GP and or the audiologist. 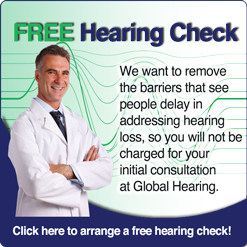 At Global Hearing we offer both under one roof. You can avail best tinnitus treatments out here. For further information or discussion we suggest you call us on (03) 9852-4440 or click here arrange an appointment with one of our experts.